Last night and on through today, parts of Minnesota are supposed to get hit with 6-10 inches of snow. Being that I am from California, and last night was the first “real” snow of the season, I was pretty excited to get up this morning and go look outside. As I walked out the front door, a fresh layer of snow covered the grounds as I watched our dog, Lily, prance through it having a grand ol’ time. As I was standing there watching the snow fall, I started to wonder if I was going to be able to do anymore outdoor workouts now that the snow and cold were here. Living in California for most of my life, outdoor workouts can be done 365 days a year. Even when it rained, it was fun to get outdoors for a workout. 1. Cross Country Skiing. I have done this once or twice before and absolutely love it. Once a good snow base forms, some family and friends of mine are going to be doing this every Saturday morning together. 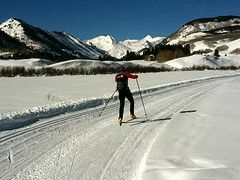 Now isn’t cross country skiing considered long slow cardio? In a sense yes, however not when done correctly. Instead of just going one speed the entire time, I plan on working in intervals. I will simply perform random “sprints” to raise my heart rate so I get more out of it. 2. Snow Shoeing. Something I have never done before but am dying to try. Once again, I will be changing things up and trying to do some sprints while doing this. 3. Snow Ball Fight. Not only fun, but a great workout especially if you do it in a big open area. This will force you to run for cover as the other team tries to attack. Just make sure you get one the team with the most baseball players. 4. Sledding and Hill Sprints. Not only is sledding invigorating, but once you get down the hill there is only one way to get back up it… So why not sprint up the hill in excitement and get a few hill sprints in while having some fun? As we have discussed before, hill sprints are one of the best workouts you can do and this time you get to reward yourself once you get to the top! 5. Speed Shoveling. For all those who have shoveled snow before, you know the workout you get from it. To make this even more intense, why not try to finish shoveling as quickly as possible? Shoveling works every part of your body and when doing it quickly, will give you a high intensity cardio session. 6. Build a Snowman… Quickly! If you have ever built a snowman, you know how heavy and tiring it can get the bigger you make it. This year, if you want even more of a workout, try building a snowman as quickly as possible. The snow and cold are not going to stop me from getting more than a few outdoor workouts in this winter and it shouldn’t stop you either. You now have 8 options for getting outdoors and working out even if it is snowy and cold. Don’t be stuck in the gym all winter. Branch out and do something different to further your fitness! Did I miss any snow workouts? Share some of your ideas below. We would all love to hear them! P.S. Before you go, help spread the word! Take .03 seconds and hit that ‘Like’ and Tweet button for me! It is greatly appreciated. Photo Credit (CC): ex_magician, TRAILSOURCE.COM, and Ryan Holst.